Spicing food up from baked beans to deep fried chips is not new to South Asian families, so the idea of spicing up popcorn should not come as a surprise either. 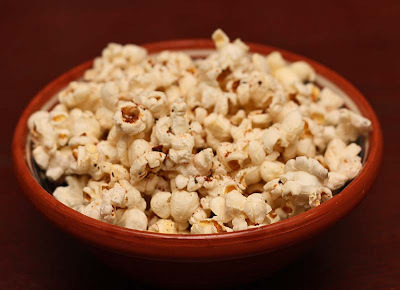 As a South Asian gal I’ve had my fair share of garam masala popcorn; even chilli and lemon spiced popcorn, more times than I care to remember, but one flavoured with sumac is new one on popcorn for me, and one that I enjoyed whilst watching a movie. 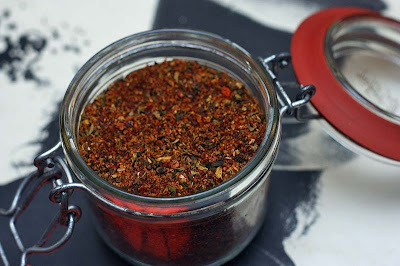 I'm not going to give a recipe as all I did was make the popcorn and then sprinkle this sumac salad spice mix that my mother-in-law brought for me a few months ago from her holidays. The packet did not state exactly what was in it, but I could taste sumac (of course) oregano, sea-salt, thyme, sweet chilli flakes, seseame seeds (I think) and a little garlic powder. ooh I love the idea of spicy popcorn; I'm definitely going to give this a go! I hope you enjoy it, paprika is also lovely. Loved the spicy popcorn,sure to try soon. I've only ever had sweet popcorn so this is something completely new to me. I'll have to give it a go. Thank you so much glutenfreewelshy. Its been a while since I've been to the movies, I may have to go with Tim Burtons Alice in Wonderland showing. I was a huge fan of Edward Scissorhands. I may have to sneek my home-made one in, as whenever I've had cinema popcorn, ive always found them a tad on the stale side. I hope you like, but please do experiment. I really like paprika and salt too. I spent 3 years of high school working in a one screen independent movie theater. Bored concessionaires come up with all sorts of ways to make popcorn more interesting (we were allowed to eat as much as we wanted), but this is much more interesting than we ever got! I bought a huge bag of whole sumac when I was visiting my folks in CA over the winter break - I haven't managed to find it anywhere here in upstate NY. It could be worse, at least popcorn is low-fat. A few years ago, I wasn't able to find sumac in the U.K, but in the past couple of years things have certainly changed. You can find small sachets at local supermarkets, and most South Asian shops sell it too. Its just a matter of time when you'll come across it in NY. I'm another spiced popcorn fan, I first ever had spiced popcorn when a friend some years ago on a whim sprinkled cracked black pepper and garlic powder on the salted popcorn and for a long time its the only way I ate it. Then I one day I tried it with some ground cayenne pepper, which was also lovely. So I'm sure your spiced up version was delish. Sumac and couscous. MMmm I'm going to try it. I'm not surprised to learn that your a spiced popcorn fan, and spicing up bean - 'double Yay' as my nephew would say. I haven't tried black pepper and garlic powder, so thanks for sharing that combo. It may be this Fridays nights snack. Sounds like something right up my alley!